2013年3月8日 | By News | Filed in: News. It’s not hard to find smart lightbulbs that bow to our every whim. Creating a well-coordinated light scheme can be difficult without tweaking elements one by one, however, which makes the Japan Science and Technology Agency’s Lighty project that much more elegant. The approach lets would-be interior coordinators paint degrees of light and shadow through an app, much as they would create a magnum opus in Photoshop or a similar image editor. Its robotic lighting system sorts out the rest: a GPU-assisted computer steers a grid of gimbal-mounted lightbulbs until their positions and intensity match the effect produced on the screen. 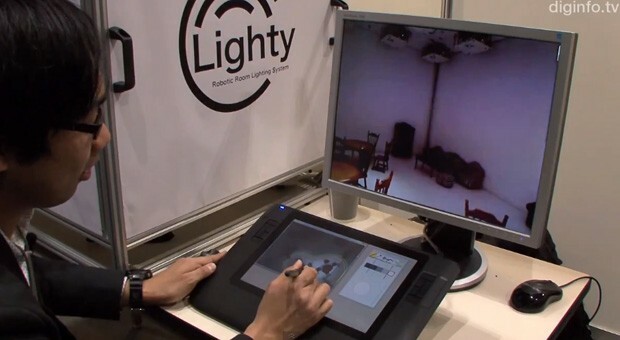 While Lighty currently exists just as a scale model, the developers plan to work with life-sized rooms, and potentially large halls, from now on. We’re all for the newfound creativity in our lighting, as long as we can’t mess it up with a Gaussian Blur filter.